I work for CANIDAE Pet Foods and for the past three years we have been at all the Amgen Lifestyle Festivals Promoting our Super Premium Pet Foods and Responsible Pet Ownership. 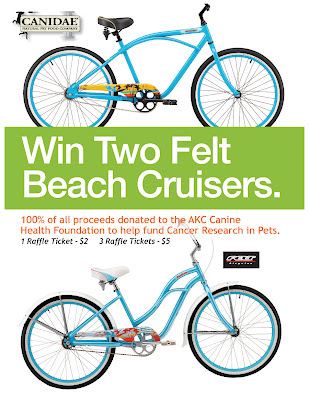 Every year we raffle off a Felt Bicycle with 100% of the proceeds going to Cancer Research in Pets. Please come by our booth with your pet, buy a raffle ticket and get some free samples. CANIDAE will be at all stages of the 2011 Amgen Tour of California, continuing to promote an active healthy lifestyle that includes pets, and conducting a raffle to raise funds for the fight against cancer in pets. Cycling fans can visit CANIDAE and purchase raffle tickets at all of the Amgen Lifestyle Festivals, located near the finish line at each stage of the race. The first stage of the Amgen Tour of California begins Sunday May 15th in South Lake Tahoe with subsequent stages winding all throughout California until the final stage begins seven days later on May 22nd in Santa Clarita. All proceeds from the company's multi-day charity raffle will benefit the American Kennel Club Canine Health Foundation to fund cancer research in pets. 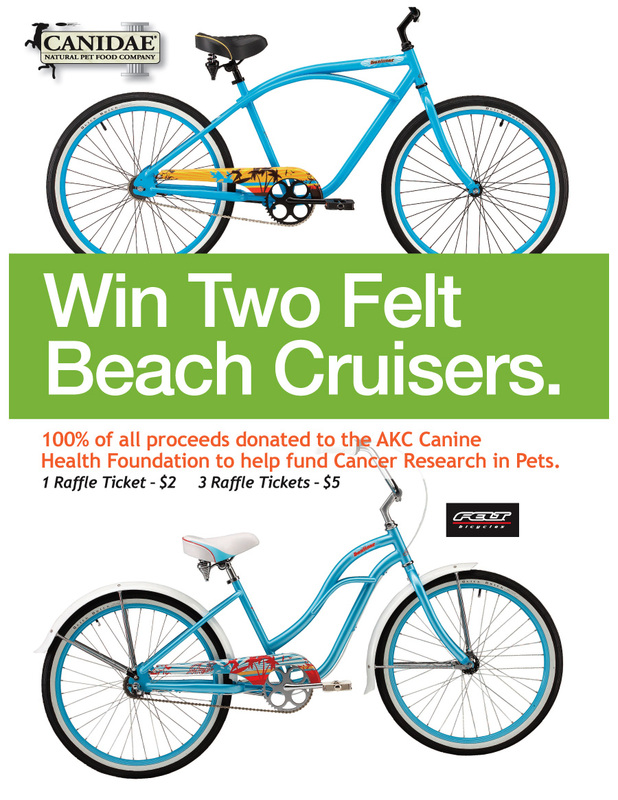 The grand prize winner of the raffle will receive a a pair of Felt Beach Cruisers donated by CANIDAE. Raffle tickets will be priced at two dollars for one, and five dollars for three. One grand prize winner will be drawn who will receive both bicycles. If present, the winner may pick up both bikes at the end of the event, otherwise CANIDAE will arrange for the shipping of the bikes to the winner's nearest Felt Bicycle retailer. CANIDAE and Felt Bicycles reserve the right to substitute a prize of equal or greater value. Founded out of a love for pets and family, CANIDAE Pet Foods promotes an active lifestyle and Responsible Pet Ownership, which includes healthy lifestyles for all of us and our pets. Part of CANIDAE's Responsible Pet Ownership message includes proper medical care and support for pets with health issues such as cancer. Nothing is more central to the core values of CANIDAE than the health, happiness and well being of pets.